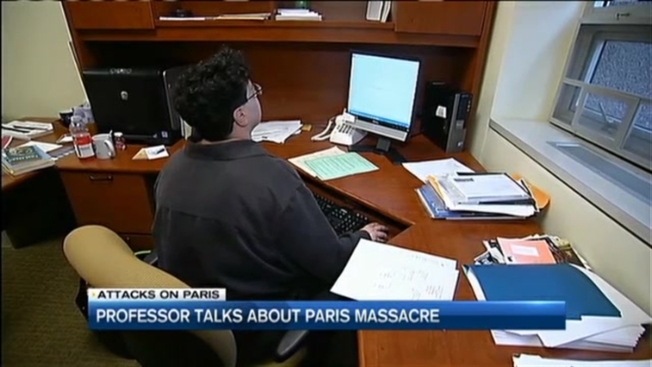 A University of New Hampshire professor is back on campus after spending a week in Paris. Last Friday night, she was just a few storefronts away from the massacre at La Belle Equipe restaurant. "It had been a quiet, lovely thing and there was sudden commotion," said Marla Brettschneider. "So many emergency vehicles start screaming, coming right at me." She doesn't speak French, but fear is universal. "It was clear that something huge and big and bad was going on," Brettschneider said. The political philosopher was in Paris to give a speech about her new book. Friday evening, she was at dinner with Parisian friends just a few doors down from the La Belle Equipe when shots rang out. "We just got out of that area," Brettschneider said. The next day Brettschneider learned that she was just steps away from the spot were 19 people were killed. She to that spot to honor the victims. "There were just ton of flowers, piled up in front of this place and it was really hard," Brettschneider said. She took a couple photos Saturday outside the boarded up restaurant during a quiet neighborhood vigil for those who lost their lives less than 24 hours earlier. "It was so beautiful and meaningful," Brettschneider said. "I felt people were in direct relationship to the loss and feeling stunned by the experience." She returned home to her family in New Hampshire on Monday with her Parisian friends in her thoughts, and hopes for peace in the face of unthinkable violence. "I think there is a lot that ordinary people can do to come together and rebuild a sense of security and safety," Brettschneider said. There were eight UNH students in Paris at the time of the attacks. All of them are accounted for and are OK.